Amazon Lending is an invitation-only short-term working capital loans that help Amazon sellers fund inventory purchases. But it’s not something growing sellers can tap for other business needs like marketing, facilities, or staffing. For these, sellers must turn to funding sources like Payability, savings, or credit solutions. Here’s what to expect from Amazon Lending, and 6 alternatives to consider. Amazon Lending Established Amazon sellers needing to fund Amazon inventory purchases. Loans are invitation-only. Payability Growing Amazon sellers that wish to get Amazon payments daily, not on Amazon’s 14-day payout schedule. Personal Income New Amazon sellers that don’t have/want to use personal savings or credit to fund initial inventory purchases. Personal or Retirement Savings New Amazon sellers that don’t want to run up loan debt or pay interest on initial inventory purchases. Personal Credit New Amazon sellers that don’t have/want to use personal savings to fund initial inventory purchases. Business Line of Credit Established businesses that need access to instant cash for short-term funding like inventory purchases. Now let’s explore each of these 7 Amazon funding options in detail so you can determine the best fit for your startup or business growth needs. As shown above, the Amazon Lending invite contains a loan offer up to a certain amount and a range of repayment terms to choose from. You accept all or part of the offered amount and choose your terms. The calculator figures your interest based on the terms you choose so you’ll know exactly what the loan will cost. Amazon then deposits funds into your bank account, usually within 1-2 days, which you can use to purchase more Amazon inventory. After funding, Amazon automatically deducts a set payment from your Amazon payouts until the loan is repaid. The payment amount is also shown on your offer so there are no surprises. Amazon Lending is for short-term funding, so payment terms are 6 months or less. If your sales numbers met Amazon’s expectations, you’ll likely receive more loan offers during and after the term of your loan. Only established sellers can qualify for Amazon Lending, and Amazon determines your eligibility. If you receive an invitation and you need a way to pay for more inventory to sell on Amazon, Amazon Lending is a simple and fast way to get short-term funding. You pay only the interest rate that you choose when you accept your offer. Most Amazon Lending loans are based on a 6% – 13% APR, but some volume sellers report rates offers as low as 2% to 3% APR. There are no closing fees with Amazon Lending. If your Amazon sales payout won’t cover the automatic payment, Amazon will deduct the outstanding amount via ACH from your bank account. You need to be aware of that to avoid bank overdrafts. If you can’t pay back the loan within terms, Amazon will ultimately seize your FBA inventory as payment and sell it themselves to settle the debt. That’s why Amazon primarily targets FBA sellers with Amazon Lending offers. Your FBA inventory sits in Amazon’s warehouse and acts as collateral, so Amazon really can’t lose. Amazon is very clear that Amazon Lending funds are to be used to purchase inventory to sell on Amazon. You can’t use it for other business expenses or for inventory that’s being sold in a retail store on another website. if you accept the loan and Amazon doesn’t see inventory added to your account, they can call in the loan for breaking the agreement. Payability deposits your Amazon sales income into your bank account on a daily basis. This process is called factoring and it’s quite simple. Payability deposits 80% of your daily Amazon revenues into your bank account or onto their prepaid MasterCard. 20% is held in a reserve to cover returns or chargebacks and is released to you on Amazon’s regular 14-day payment schedule. Any seller that wants to control their cash flow and not wait for Amazon’s 14-day payouts will appreciate Payability. Sellers who need to move fast on inventory buys, or that need to cover due-on-receipt payments throughout the month can benefit from Payability’s daily deposits. Payability’s 2% fee is based on your total Amazon sales, but that’s all you pay. Payability has no startup or cancellation fees, and there’s no loan to repay. Payability simply advances you your own Amazon income faster than Amazon pays it out. Payability also gives you an option to have your deposits placed on a prepaid MasterCard that pays 2% cash back on purchases. Going this route offsets much of Payability’s 2% fee. The only 2 requirements are that you’ve sold on Amazon for over 90 days and average at least $2,000 in monthly in sales. But, Payability only advances your daily sales revenues. You can’t get more funding over what you earn daily on your Amazon sales. Do you have some salary left over after your personal expenses are paid? Then you can put your personal money toward inventory buys and save on the interest rates that come with using credit. For many new Amazon sellers, this is ideal since startup inventory buys can require minimal investment. Sellers focusing on Retail Arbitrage, used goods, handmade, and collectibles usually get started this way since it doesn’t cost much to test a few items out on Amazon. If you do your product research using Amazon’s free price scanner app and are careful with your early purchases, using personal income lets you avoid tapping into savings or building up credit card bills before sales start rolling in. You pay no fees or interest when you use personal income as startup Amazon funding, but you do need to track your expenses just like any other business. You’re limited by what you can afford to spend out of your normal income, so you might not be able to afford larger discounted inventory purchases. But this shouldn’t be an issue in your startup phase since you don’t want to purchase in volume before doing plenty of product testing. You can tap personal savings and even certain types of retirements accounts to fund your startup business. Investing funds from your savings accounts are simple. You can invest them in your business by moving them to your business account and keeping close track of your total investment for accounting purposes. If you have a retirement account, like a 401k or a traditional IRA, you can access those funds to start or help grow your Amazon business. You do this by setting up a Rollover for Business Startup (ROBS) account, which requires some setup and a minimum $50k investment. A ROBS allows you to access retirement savings for business purposes without paying taxes or early withdrawal penalties. Anyone that has enough savings to cover startup inventory needs. Pulling from a basic savings account can be an ideal way to purchase some startup inventory and give Amazon a go. A ROBS takes far more setup and requires that you pull at least $50K from your retirement account as a seed investment in your company. So a ROBS is really for a larger enterprise. But each lets you invest in yourself and avoid paying out interest to creditors. Pulling from savings only costs you the lost interest on your invested income. A ROBS is far pricier than typical savings. A ROBS provider will charge startup costs of around $5k, plus monthly administration fees. You’re limited to the funds you have available in your savings to invest. If your retirement fund doesn’t have at least $50k in value, you can’t roll it into a ROBS. If you have at least $50k of retirement funds that you’d like to use to fund your startup business, you can schedule a free consultation with a ROBS expert. Get all your questions answered and make sure a rollover as business startups is right for you. You can make early Amazon inventory purchases on personal credit cards or with a personal loan, but it’s important to carefully track these as business expenses for tax purposes. With a line of credit, like a home equity loan, you can move funds into a business bank account and use them to make your purchases. Tracking your personal investment and business expenses is key to making this work when tax time rolls around. New sellers with existing personal credit cards or lines of credit, or personal credit scores that allow them to get enough credit to cover early Amazon inventory buys. From 2% to over 4% for home equity lines of credit, 13% & up for credit cards. But be vigilant! 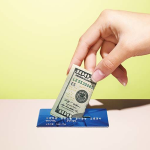 While there are some 0% credit card offers, credit cards often have high interest rates. If you carry balances month-over-month, the interest can stack up and cancel out your Amazon profits. You’re limited to the available balances on your credit cards or lines of credit, but it’s important to avoid going overboard buying unproven inventory. It’s very easy to spend credit and wind up in a bind when the bills come in. 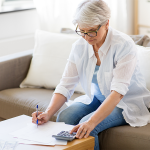 Balances, interest, and late fees can quickly stack up and wreck your cash flow and credit rating if you’re not careful. So tap into personal credit sparingly and with a hefty dose of reality. For new businesses, a small business credit card can be a great option. Not only do they have generous cash-back and travel rewards programs, but they can also help you build your business credit score. Plus, you don’t need an EIN to apply. With a business line of credit, you can instantly move cash funds into your business checking account without incurring the higher cash advance interest rates that credit cards charge. This is very helpful for making Amazon inventory purchases as your business grows. You’ll find that suppliers prefer wire transfer or check payments as your orders get larger. Some will even discount your order if you make up-front payments. With instant cash from your line of credit, you can take advantage of every possible deal. Then you simply pay off your line of credit balance as your products sell. You’ll accrue interest and have a minimum amount due on your balance each month, like a credit card. But if you use Payability’s daily Amazon payouts, you can pay a little toward your balance each day or week to minimize your interest. Established businesses with some banking history. You can open a revolving business line of credit where you do your business banking, or use an online source like Kabbage. Lines of credit are opened under your business entity, but in many cases, your personal credit score is used to determine your interest rate and credit limit. Business lines of credit interest is based on creditworthiness, can range from 12% to 50% APR, depending on the credit amount and other factors. Bank lines of credit often have an annual fee, too. You’re limited by your credit line, but otherwise, business lines of credit are extremely flexible and popular for funding short-term working capital needs or inventory buys. Prequalifying for a small business line of credit with Kabbage is quick and easy. If you’ve been in business for 1 year, generate $50k+ in annual revenue, and have a credit score above 550 (check here for free) you may qualify for up to $150k. Business loans differ from a line of credit in a few ways. The application process can be more demanding and, once funded, you pay interest on the full amount of the loan from day one. Even if the funds sit unused in your bank account, you paying interest on the full amount until you start paying it down. You also have a set term for repayment, like monthly payments over 3, 12, or 36 months. You need a business entity to get a business loan, but there are some startup business loan options for relatively new businesses. Short-term loans, like those offered by OnDeck, are meant to fund fast and be paid off quickly, usually under 3 years. For Amazon inventory buys, Amazon Lending fills this role at far lower interest rates. But if your business needs to finance something other than Amazon inventory, like commercial real estate or equipment, a long-term business loan can be the best option. While rates start at 9.9%, short-term loans from OnDeck typically have a 30%-50% APR, depending on your creditworthiness. You’ll get lower rates with conventional longer-term Small Business Administration (SBA) loans or bank loans which run from 5% to 10% APR. But these generally require a detailed loan application and a proven business record. In most cases, you’re free to use business loan funds for any needed business expense. However, some business loans for specific capital improvements or equipment financing limit usage to stated purposes. Getting prequalified online with OnDeck takes just a few minutes. Well qualified borrowers can qualify for $5k – $500K in small business financing with rates as low as 9.9%. Amazon Lending is a highly competitive inventory financing option for Amazon sellers. Unfortunately for startups and struggling sellers, Amazon only invites the success stories to the Amazon Lending party. Until you gain their attention, you’re on your own when it comes to financing your inventory purchases. You can fill the funding gap several ways. Personal income, savings, and credit are what most sellers turn to first. Once sales start rolling in regularly, Payability makes it easier to get your Amazon money faster, pay suppliers more quickly, and support growth by controlling your cash flow. After you’ve proven your model, you’ll have more funding options at your disposal. By then, combining a few solutions can provide the flexible funding needed to chart a path for growth on Amazon and beyond, if that’s where your business takes you. Do you use Amazon Lending, Payability, personal funds, or lines or credit to fund your Amazon operation? If so, which financing solution or combination of methods works for your business? We’d love to learn about your experiences in the comments below.